Superbowl showdown II, a winning chili? Last year, dedicated reader, you will recall we had a Sunday Gravy throwdown during the superbowl where the Jew was victorious for best gravy. You were dedicated enough to read all the way back to last year weren’t you? Dedicated enough to watch the butternut squash fly? Dedicated enough to make it to this sentence? Alas, last year the best meatball prize was a bit elusive for us, but you can’t win ’em all. Besides if I didn’t let my Italian friends win something, the Jew could have found himself with cement shoes and sleepin’ with the fishes. With this event, a new Superbowl tradition has begun — an annual cook off with my buddies. This year though, its chili! Between the blog, trash talking and Facebook, we have a lot more competitors this year. What began as a three-way (ooh la-la), this year is now a 6 way (ooh la-la’er!). Let the games begin. I love chili, but my problem is every time I make it, it’s different. I usually totally wing it: beans vs. no beans, all day vs. 1/2 hour, chicken vs. beef, spicy vs mild, red vs. white, cilantro, jalapeño, man the options just go on and on. My chilis are all good, but I have zero consistency and you know how consistency is king when competing. 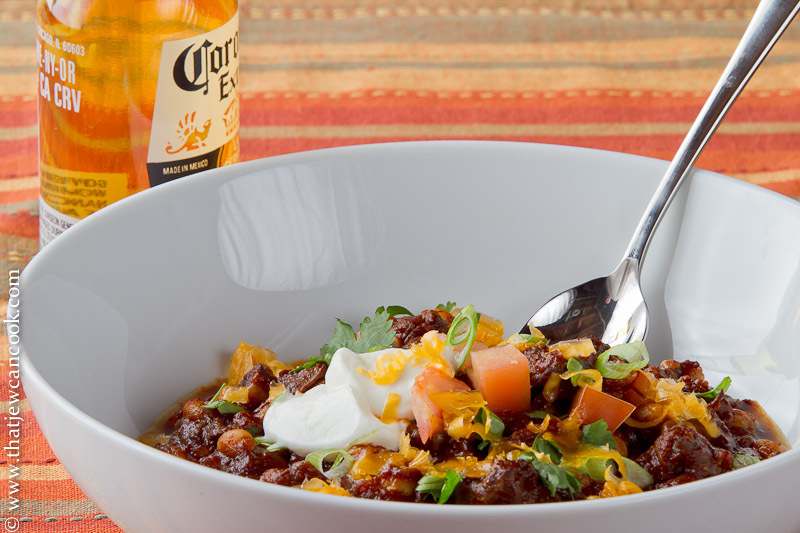 For a week or so, I’ve been poring over known good chili recipes to use as a starting point and today we found one. The ingredients sounded right so it was time for a taste test. Good thing, because even after my subtle doctoring of the original recipe there are still a couple of changes I want to make. But make no bones about it, I am here to win and I think I have damn good shot. Never mind the quick and dirty picture. I didn’t feel like going too crazy staging and lighting and what not, nor did I do much post processing. This won’t be one for the Foodgawker crowd. After falling in love with natural light during my last shoot, I decided my cave-hole studio needed much more light. If you look carefully in the spoon, you can see me and my new toy: a honkin’ huge covered 82″ umbrella (Paul C. Buff PLM 82). Once I get the hang of things and stop rushing, you should start to see some better quality. Now where was I? Oh yeah, chili. So this chili was pretty damn good. A few little tweaks next week and I’ll go for the medal. Duh, this is redacted too! I’m not giving up the goods yet. Sorry Gina, Al, Frank, Jon, Alex, and Nick; if you’re trying to get a jump on me, the pic is the best you are getting. Check after the Superbowl to see my recipe. You know, the one that won. I’m in! Take a look at my love in a bowl for the carnivore posted last week! Can’t wait to see yours! And then I think we should do French Onion Soup! Ha! I, too, have trouble with consistency when making chili! And I too have myriad ways and ingredients to make it. Last time I made it with meat, I added a bit of cinnamon, which at first, was delightful. But I froze the leftovers and when I reheated, the cinnamon was more pronounced, making it taste weird. Then, I made a vegetarian chili that just rocked! I was amazed I was able to get so much flavor with just vegetables. Will I ever be able to repeat it again? Who knows? I’ve also been having some severe cravings for Cincinnati chili and just got a recipe sent to me from a friend. But since me and the DJ are “dieting” me thinks no chili will grace our tables for a while (check out my next installment of “Lighten up!”) Good luck, Andy, can’t wait to hear all about your chili conquest! Have fun, and good luck. And if that French Onion Soup thing is on, I’d love to know about that too! I make chili from the seat of pants too. A little of this, a little of that, beans, no beans. I have nothing to call my own. I am rooting for you!!! I am hoping that you are going to post this recipe after the competition is over, and you declare your victory.